Our district is happy to provide safe bus transportation to qualifying students. 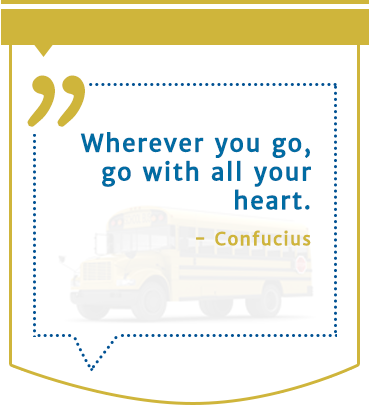 Please check in with us regularly for updated bus routes and rules. Students should remember that riding the bus is a privilege, not a right. All passengers must follow the bus rules in order to take advantage of this service. No eating or drinking on the bus without permission of the driver or sponsor. We do not allow destructive behavior, and we require students to keep the bus clean. Students must cooperate with the bus driver; your life is in the driver's hands. The bus driver may assign seats if necessary. Stay in your seats facing the front of the bus through the duration of the trip. Do not block the aisles. Keep head, hands, and feet inside the bus at all times. We will not make unauthorized stops without advanced arrangements. Students must keep the noise to a minimum. View our travel expectations and schedule information.